After almost a week of heavy meals (usual St. Patrick's day related dishes, and lots and lots of desserts), I'm ready for some lighter and more simple meals this week. Today, Chinese style fried rice, really hits the note. Heat up the cooking oil on a wok or a large skillet over high heat. Add shallot, garlic and ginger, and stir fry until they turn fragrant. Add chicken breast, shrimp and green peas. Continue cooking until the chicken is no longer pink. Add steamed rice into the wok, followed by soy sauce, fish sauce, oyster sauce, salt and pepper. Stir to combine for a couple of minutes. Add scrambled eggs into the fried rice, mix well. Transfer to plates and serve immediately. This looks beautiful and fragrant - and I love your bowls! 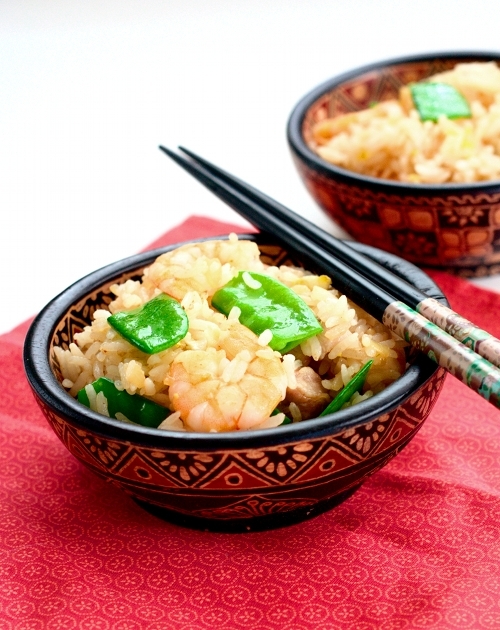 This looks unbelievably good--and you're so right that day-old rice is easier to stir-fry!